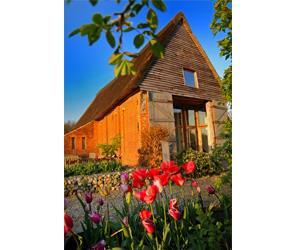 Hoste Barn provides a fantastic luxury retreat quietly situated in woodland and open farmland, not far from the National Trust Blickling and Felbrigg estates and the private stately homes of Mannington and Wolterton. The original timber framed roof throughout gives an immense sense of space and light from all perspectives. Antique yorkstone floors, underfloor central heating, fully fitted oak and granite kitchen, hidden widescreen TV and full cinema surround sound, DVD, broadband internet, mezzanine master bedroom, ensuite, downstairs bedroom with ensuite wetroom shower and double sinks. Quality golf courses 20 mins away Norfolk Broads & sailing 20 mins away Swimming pool & gym 5 mins away Tennis onsite City of Norwich 20 mins Children welcome from any age. From Norwich take B1150 to North Walsham, go through Coltishall. Continue through Scoltow with The 3 Horseshoes pub on your right. Continue on the B1150 past the turning signposted to Swanton Abbott, to Westwick where there is a staggered crossroads. Continue straight until the road dips into a wooded area with large pond on right. Take next left signposted Swanton Abbott 1.5 miles. Proceed for 1.5 miles until you come to the sign Swanton Abbott. Bear right. Hoste Barn is 300 yards on the left.